But a rose is not a daisy or an iris or a pansy. More is not less, and over is not under. The Associated Press hasn’t changed its mind on how journalists should use those words, but I wonder whether it’s only a matter of time. This week the Associated Press changed a rule in the AP Stylebook. And the change was met with howls of disgust and outrage – mine. But I wasn’t the only one howling. But AP now says you don’t have to bother with the distinction anymore. Whatever works. It’s all good. You know why it has become common usage? Because not enough people have bothered to learn what’s correct. That isn’t a good reason to lower your standards. It’s like the language equivalent of grade inflation — if no one can earn an A anymore, just lower the bar so what used to get a B grade is now worth an A. Why would anyone say that? If you “could care less,” it means you care. If you care, it bothers you. It makes no sense to say that if you mean that it doesn’t bother you. But because so many people now say it, it’s “common usage,” the same theory AP has used to say that “more than” and “over” are interchangeable. Lewis Carroll’s Humpty Dumpty in “Through the Looking Glass” said, “When I use a word, it means just what I choose it to mean — neither more nor less.” And that’s exactly how we get to this point. There used to be a difference between the meanings of “composed” and “comprised.” But some people didn’t learn it, others couldn’t remember it, some of each didn’t bother to check before they used one of the words, and after a while the dictionary started listing both definitions as correct for each. “Common usage” doesn’t make it right. And no, I don’t propose that those who know the difference go around correcting everyone publicly when people use words incorrectly. But if the people who use words for a living give in to the incorrect uses, then what? If enough people say blue and yellow are the same color, eventually the words for them will come to have the same meaning, but that will mean only that the words have lost their usefulness. For a few years, “innovation” got a big push, at least in newsrooms. Journalists, in fact, generally have done the most innovating in the business, making their news more mobile, more diverse in form. The current focus on paywalls and how to grow the online subscription business helps the business survive, and it might even be considered an innovation if the purpose is to change the industry from one relying on cheaply acquiring an audience in order to sell lots of advertising to one that relies on creating a product that people are willing to pay to acquire — but it doesn’t serve customers. Continuing to provide the public with the same information we’ve always provided them isn’t an innovation. There has to be more. Look at the way people use technology – and how rapidly that technology is moving. Ask yourself whether the way you do business makes sense in that world. What is the job people come to you to get done? “This year, the amount of time consumers spent using mobile devices—excluding talk time—will grow 51.9% to an average 82 minutes per day, up from just 34 minutes in 2010, eMarketer estimates. A friend who is a web editor asked on Facebook what her journalist friends think of the news that the new owner of the Orange County Register is going all-in on a print-first approach to news. My initial response was that it was “goofy.” After letting the idea simmer for a few hours, I can substantially amend my response. This is no small thing. Moving to a subscriber-based model means you believe you can make money primarily from the content you produce, not from finding advertisers who want to reach your subscriber base. Beefing up the staff, then, is just putting your money where your mouth is – the exact opposite of putting up a paywall while also cutting staff and/or pay. That said, I still think there are limitations to the model. If the beefed-up Register succeeds, I tend to think it eventually will become a niche product for a high-information demographic. If smartly marketed – and keeping a free website for breaking news and pushes to the paper or an all-subscription site is a part of that – it would not be resigning itself to a forever aging and shrinking demographic, but it almost certainly would find itself with a small one: older than average, wealthier than average, better-informed than average. Not a bad demographic to have, for outside promotional events and whatever advertisers might remain, but not a mass-circulation base. When my grandfather was a young man, it was an absolute given that if you read a newspaper, you did it after work. By the time my father started dating a pretty, young features writer at the Columbus (Ohio) Citizen-Journal, that was no longer a given. 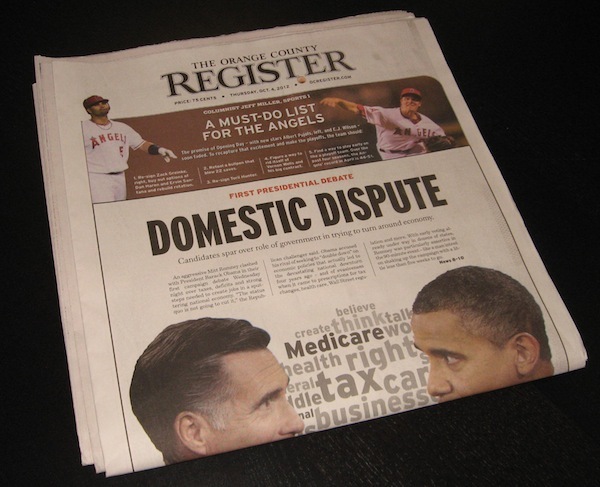 By the time I worked a summer internship at The Phoenix (Ariz.) Gazette, that was one of the few afternoon papers left in the country, and it was on its last legs. Why the change? Were the morning papers that much better? In some cases they may have been, but that wouldn’t explain a nationwide phenomenon, so no. The change came about purely because of changes in people’s lives. It began to make more sense to people to read a morning paper. Their afternoons maybe became busier and busier, or the evening TV news filled their information needs better than a P.M. paper because the TV news was more up to date. Whatever the reason, it was less a vote on the afternoon paper than a symptom of larger trends in society. Similarly, newspapers today are not facing financial trouble because they are “giving away” their content online – or, if you believe that is a genuine problem, not solely or even mainly because of it. Morning newspaper circulation had been in decline before most people ever heard of the World Wide Web. The advent of the Web, then the high-speed Web, then the mobile Web merely accelerated the trend and added on the burden of advertisers having new options for reaching people. The decline of the printed newspaper can be seen as merely part of a continuum of change in how people choose to get information, and there’s no reason to think the change is stopping where it is now. And if that is the correct view, then restricting your information to print – even a high-quality, smartly marketed product – is swimming against the tide. It doesn’t mean you can’t make a living at it, but you are planting yourself squarely where the majority of people have decided they don’t want to be. You might be able to entice some to visit, those few who highly value what you have to offer, but the day will come that you are not and never will be a mass product again. Maybe that isn’t so important to you, and maybe journalism will be better served this way, but just understand where it is you are going. The reactions my web editor friend has gotten to her post are (as of this writing) largely from the “focused on what is lost and how things used to be” end of the spectrum. There is no Ghost Dance for newspapers. What’s past is past. You can celebrate it, but you can’t bring it back.